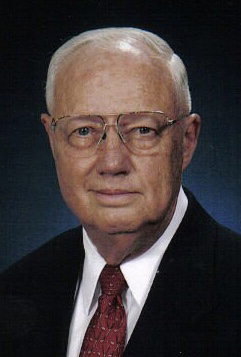 Dr. Harold “Doc” Frederick Haines Jr., 87 of Taylorville passed away on Tuesday, June 26, 2018 at 11:21 p.m. at St. John’s Hospital in Springfield, IL. He was born on July 2, 1930 in Chicago, IL the son of Dr. Harold and Mildred Haines Sr. He married Delmarie Smith on April 21, 1957 in Saybrook, IL. Doc worked as a chiropractor owning his own practice in Taylorville. He was a Charter Member and Deacon at Grace Baptist Church in Taylorville and Past President and member of the Illinois Chiropractic Society. He served in the United States Air Force spending time in Japan and the Asian Theatre. Doc graduated from Taylorville Senior High School, the University of Illinois and Lincoln Chiropractic College. He was an avid golfer at Lakeshore Golf Course. He is survived by his Wife: Delmarie Haines of Taylorville, IL; Daughter: Lynnette Haines and husband Jeffrey Lynn of Janesville, WI; Grandchildren: Jordan (Loretta) Wiley of Castle Rock, CO; Elyse Wiley (Jim Wennmacher) of Peoria, IL; Brothers: Duane (Sharyn) Haines of Richmond, TX; Sisters: Erlene (Tom) Strenfel of O’Fallon, IL; Diane (Larry Cooper) Godat of Greensboro, NC; Several Nieces, Nephews and Cousins. He was preceded in death by his parents, and daughter: Paula Windell. Visitation will be held on Saturday, June 30, 2018 from 9:00-11:00 a.m. at Grace Baptist Church in Taylorville, IL with the funeral service immediately following the visitation starting at 11:00 a.m. at Grace Baptist Church in Taylorville with Pastor Gerald McPhillips officiating assisted by Pastor Philip Neumann. Burial will be held at Camp Butler National Cemetery in Springfield, IL on Monday, July 2, 2018 at 10:00 a.m.